Registrations to enter the Gran Fondo Giro d’Italia, organized by the Giro d'Italia, have been officially opened today. 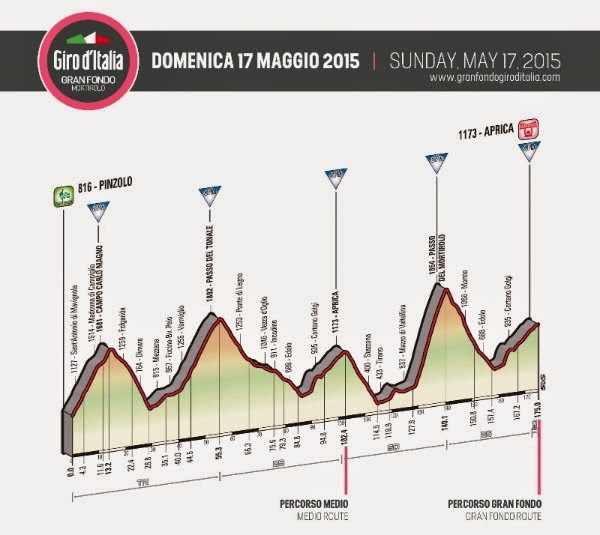 The Gran Fondo Giro d’Italia will be held on Sunday May 17th 2015 over the route of the Corsa Rosa’s Queen Stage – from Pinzolo to Aprica – and will feature the same climbs, the same descents, the same hairpins and the same distance that will test the pro riders just a few days later, in what is one of the most keenly awaited stages of the 2015 Giro d’Italia. The Gran Fondo Giro d’Italia offers two route options: the Gran Fondo long route of 175km, and the medium route of 102km which finishes after the first arrival at Aprica. To participate, non-Italian resident riders must either be registered to a national cycling federation, or have a registration recognised by the Union Cycliste Internationale, or hold a medical certification for the race. Registrations will be closed on April 30th 2015. For those who wish to sleep in Pinzolo (at the start): at the end of the race you have the option to return on a coach service leaving from Aprica either at 17:00 or after the broom wagon’s arrival at the finish. For those who wish to sleep in Aprica (at the finish): a coach service with bicycle transport will leave at 05:00, taking you to the start location. For those who wish to leave the car in Aprica (finish) and sleep in Pinzolo (start): a coach service with bicycle transport will leave on Saturday 16th May at two different times: 15:00 and 18:00. Baggage will be delivered back from Pinzolo to Aprica with a dedicated van service, to be delivered to the start no later than 07:30. All riders will have the opportunity to take up some of the hotel offers created specifically for the Gran Fondo, which are available both in Pinzolo and Aprica. At registration, please indicate your preference for the hotel option, in order for the offers to be prepared. Further details of the specific hotel offers will be communicated before January 31st 2015.